Depressed First Lady, Clara Chime, Under House Arrest By Her Husband, the Governor of Enugu State? Clara Chime, the First Lady of Enugu State, says Governor Sullivan Chime, has placed her under house arrest, and has cried out for assistance to reach human rights bodies to rescue her. 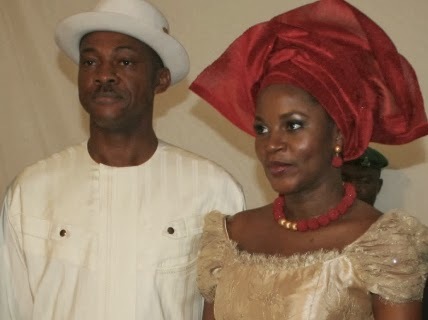 In a letter dripping with pain and suffering, Mrs. Chime disclosed that she married Mr. Chime in October 2008 but that she has been unable to share the matrimonial bed with him for over four years. Describing her desperate situation, she said that even President Goodluck Jonathan and First Lady Patience Jonathan have intervened with her husband without success. “My father is late, my Mum and few of my siblings are confused and have done all kinds of prayers they know of, 3 of my siblings prefers me dead than to see me leave the Government house. He treats my Mum and my siblings bad,” she wrote. The doctors, she noted, are scared of her husband the Governor, to whom nobody can tell the truth. According to the letter, the Catholic Bishop of Enugu state (Callistus Onaga), and top priests have come to intervene, as have the President and the First Lady of the nation, without success. Mrs. Chime further complains that Governor Chime has ordered her to leave with her four-year old son whom she conceived before their wedding. However, the governor, according to her, later threatened to disown the boy should she leave with him. Mrs. Chime further complains she has lost touch with the real world and all that makes her beautiful because of the side effects of the drugs she is taking, stressing that she is under house arrest for committing no crime. She said that even the security detail in the lodge has resorted to praying for her, while the few that can be bought with money are taking advantage of the situation. This is mental illness talking.Unfortunately its loved ones who try to help that bear the brunt of the paranoia.Trust me,I know.